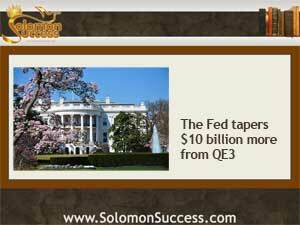 Solomon Success > Blog > More Tapering’s On the Way: Good News for Investors? King Solomon’s proverbs tell us again and again that the way to a prosperous life is through wisdom and hard work. “The slothful hand hath wrought poverty: but the hand of the industrious getteth riches,” he writes in Proverbs 10:4. Today, industriousness in the form of better employment numbers and an uptick in the housing market is prompting the Federal Reserve to scale back its stimulus plan by another $10 billion a month, signaling faith hat the economic turnaround may last for a while. The Fed’s stimulus plan, officially known as Quantitative Easing version 3, or QE3, has been in effect in some form since the housing crash that brought the economy to its knees a few years ago. And in 2012 it stepped up the program in its present form, with the plan to buy up massive amounts of mortgage-backed securities and bonds to keep interest rates low and stimulate consumer buying. We’ve been following the taper-down saga since it was announced back in September 2013. But the plan to gradually ease back on the securities buyup depends on strong economic indicators and confidence that the economy can withstand a rebound in interest rates and shifts in the global money markets as a result. The first stage of the taper brought down the total buyup by $10 billion a month – a mere drop in the bucket as far as its impact on the plan as a whole was concerned. And it came at a time when the leading indicators of an economic rebound were showing modest, if not stellar, improvement. But cutting the plan by another $10 billion chops out a total of $20 billion a month from the plan – and that’s a fairly significant amount. As a new article from US News and World Report points out, it’s noteworthy that the Fed, as it undergoes a change in leadership, voted unanimously for the cutback. That, say financial experts and economists, signals confidence in the economy’s future and sends a message that the recovery is expected to continue, with stronger job numbers and more activity in the housing market-even though interest rates are likely to rise. The move isn’t being so well received in the international money markets, though. Some currencies may lose value against the dollar as a result and trading may slow. And investors in income property can expect to see some higher interest rates, too. That has some economists concerned about whether the country can stay stable without that artificial boost. Kurtzleben, Danielle. “Federal Reserve Continues Taper, Cuts Monthly Purchases $64 Billion.” US News and World Report. USNews.com. 29 Jan 2014. The Fed Starts to Taper – But Who Benefits? Should Investors Prepare for Septaper?